← This Time Mother Nature Wins! Threat of Heavy Rain & Strong Winds Keep Us from the Long Beach Flea Market Tomorrow, March 18th. We are rained out of the Long Beach Flea Market and are setting up the Billy Blue Eye Virtual Flea Market for you to shop Sunday, March 18th beginning at 7:00 AM. We will be featuring selections from our recently acquired inventory from all of your favorite pottery companies including Roseville, Van Briggle, McCoy, Haeger, Red Wing, Hull and Weller to name a few. This is an easy and fun way to build your collection with terrific incentives to acquire beautiful ceramic and stoneware items at special one day pricing. A friendly shopping experience from your own home protected from today’s drenching rains and winter storm. Easy, safe and secure payment options – MasterCard, Visa and Pay Pal accepted. Our five years of knowledgeable, customer service with our guarantee that you will be satisfied with your selection. 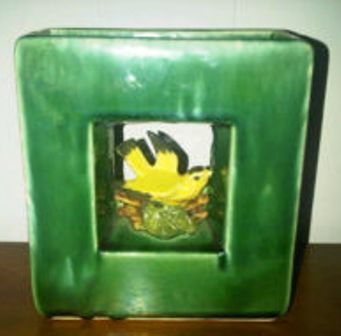 We open at 7:00 AM and for you early birds here is a great McCoy Arcature vase that we just acquired. 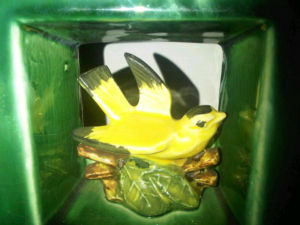 First to claim it by e-mail will be very pleased with this 1951 McCoy treasure. E-mail us direct with your questions or to hold this vase at BillyBlueEye@cox.net. We will be busy tonight gathering inventory and setting up our shop. We hope to hear from you tomorrow! * Please note that special “Virtual Flea Market” pricing has ended. Please contact us for current special offers.